More than 190 pages of Barry County, Missouri history and genealogy including 44 pages of family biographies plus 65 Barry County, Missouri communities on 41 different maps. 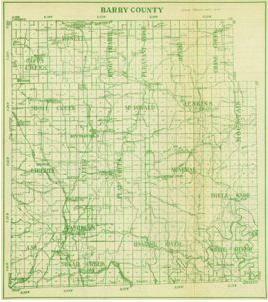 Includes the cities of Cassville, Monett, Purdy, Exeter, Washburn, Seligman, and more. 1821, 1831, 1835, 1838, 1839, 1844, 1846, 1849, 1850 (two versions), 1861 (two different), 1862, 1863, 1869, 1872, 1873, 1876, 1886, 1887, 1888 (two different), 1890 (two different), 1891, 1899, 1901, 1902, 1904, 1907, 1911, 1913, 1920's, 1922, 1929, 1930's, 1934, 1940, 1942, 1948-49, 1950. Included are six pages concerning Barry County, Missouri from the 1913 edition of The Missouri Red Book and contains about every imaginable statistic you could want for this time period. Some of the facts contained are the number of farms and their acreages, number of cows, horses, mules, pigs, sheep, goats, poultry, colonies of bees, how many farms had mortgages and how many were free of debt, the amount of butter produced, the number of bushels of apples, peaches, pears, etc. harvested, the number of quarts of blackberries harvested, the number of schools and teachers, plus hundreds of other detailed statistics. A wealth of information! More than 40 postcards show vintage scenes of Barry County, Missouri from the early 1900's to the 1980's. Greatest emphasis is on the Cassville, Missouri, Roaring River State Park, and Monett, Missouri areas. Several seldom seen Barry County, Missouri cards are included. Every card is shown at full size and in full color. Section Four of four, ALL on one CD: The complete 1888 Goodspeed's History of Barry County, Missouri. This detailed (195 pages in all) book has an incredible amount of historical and genealogical information about Barry County, Missouri from its earliest settlement up to 1888. This is an exact photo replica of all the pages pertaining to Barry County, Missouri including all of the historical and family biographical information. Military Affairs of Barry County, Missouri (Civil War history) including movements of Union and Confederate forces and including battles and skirmishes. Includes a lengthy list of soldiers and an indication of Union or Confederate. History of Barry County Cities and Towns including: Butterfield, Cassville, Corsicana (or Gadfly), Exeter, Flat Creek, Hailey, McDonald, Mineral Springs, Monett, O'Day, Purdy, Roaring River, Seligman, Seven Stars Springs, Shell Knob, Washburn (or Keetsville), plus other old settlements. Abernathy * Arnaud * Attaway * Bayless * Bedwell * Bennington * Blankenship * Boucher * Bradley * Breece * Brumfield * Bryan * Campbell * Carlin * Carter * Chamberlain * Courdin * Davis * Draper * Earle * Edens * Ellis * Elswick * Evans * Fawver * Felker * Fly * Forbis * Gardner * Gladden * Goodnight * Gregory * Hailey * Hemphill * Hilton * Hisaw * Horine * Horner * Hudson * Hutchens * Jeffries * Kersey * King * LeCompte * Legrand * Long * Lucky * McBride * McCary * McClure * McCormack * McKinney * Maiden * Manley * Marbut * Martin * Means * Montgomery * Mooney * Morgan * Morton * Northcutt * O'Dwyer * Overton * Perryman * Plummer * Prickett * Ray * Redwine * Robbins * Robinson * Rose * Rowley * Sartin * Shepherd * Sidway * Sons * Steele * Townsend * Trolinger * Vermillion * Wallace * Warren * Webb * Wellshear * Williams * Wilson * Withers * Wooten. The cost for this CD containing all four sections described above is only $9.95 plus shipping, or only $5.95 as a digital download! A large amount of history and genealogy information for very little cost! A truly fascinating view of Barry County, Missouri from its first settlement to 1888. FREE Sample family biography available. Since we offer many different county history and genealogy CDs, please be sure to specify that you wish to order the Barry County, Missouri History, Genealogy and Maps CD. If ordering more than one CD, the shipping cost is $1.95 for the first CD plus only 25 cents shipping for each additional CD purchased.